Is there global warming? Yes, it appears there is. Is it man-made? Yes, partially. Is it natural? Yes, partially. Is it the fault of cows? Yes, partially, but no more than people and other animals. In fact, there are many more people and other animals than cows. Is it the fault of cars? Yes, partially. Is it the fault of industry? Yes, partially. 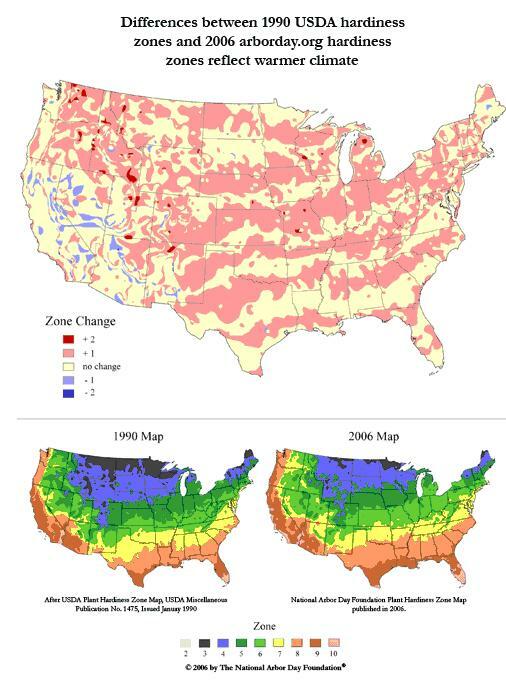 There’s too much arguing and far too much politics in this debate for there to be a consensus anytime soon, but one thing is certain – plants believe that there is global warming, and they are responding to it. 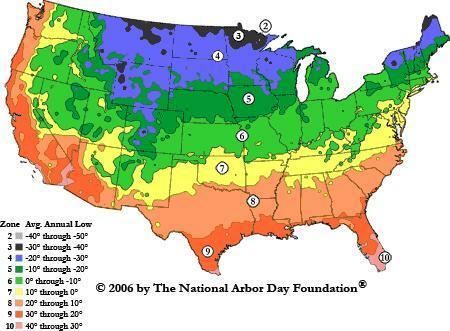 Here is a map from the National Arbor Day Foundation showing the changes in the cold hardiness map from 1990 to 2006. So, what does this mean? At least for some period of time, you can grow some plants that used to freeze in your area. For example, the people who live in Zone 8 can once again grow loquats. That advantage along with plants being more cold tolerant when grown under an organic program gives us a whole new palette of plants. To be on the safe side, you should stay with the tried and true natives and well-adapted introductions.